I had sold real estate in London, Ontario for many years starting in 1976, & although I was successful, even had my own Brokerage, I did not like the working hours. While most of my friends were working 9 AM -5, I was working 5 PM -9 weekly & through much of the weekend....most people are only able to view homes in the evening & on weekends. I knew sooner or later that I'd be married with children & I wanted to be able to spend time with them. While driving between appointments & open houses, I would find myself day-dreaming about doing something else....but what would it be? I needed to use my imagination Was there something I could apply my talents, skills & abilities to? I remember telling a good friend as we were cross-country skiing, "I want to invent & sell something where we sell thousands, at a low price & earn just a few dollars on each one - some kind of widget." 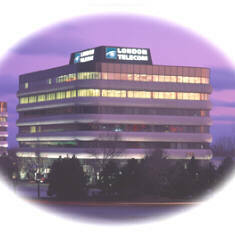 Many years later, London Telecom would become very close to that...with 150,000 monthly billed customers, we earned a few dollars profit on each account. Several times over my real estate career I had tried to find something else. Even in the field of real estate, I tried switching from residential to commercial. The hours for commercial real estate people are general business hours. That lasted about 3 months....I made one deal. I found that residential sales was more fun....dealing with ordinary people...husbands & wives...families. Even though I hated the hours, bills had to be paid, so I ate crow & went back into residential real estate. Over the years, I had quite a client base....cultivated with newsletters, phone calls, visits...always keeping in touch with follow-up. Still, I was restless & wanted to break out somehow. I took different night courses at Fanshawe College, including business & marketing. At one point, because I had been flying hot air balloons for many years as a hobby & carried advertising on the balloon, I figured I would get into the commercial ride business. I always enjoyed people & thought this would be a great thing to do....something I really liked. I sold my house & ordered a large 6 person balloon. It would arrive in January of 1986, & I'd start right away...I'd already advertised & had bookings set up. Since I was concentrating on this new business, my real estate slowed down & I had few closing commissions to pay the bills. Further to this, true to Murphy's Law, the weather closed in bad. For 4 months, from January to April, it was nothing but one storm after the other...high winds, snow, sleet, rain....not conducive to the fair weather sport of ballooning at all. What would I do? With no money coming in & bills to pay, drastic steps had to be taken. The first thing was to take in tenants at the townhouse I was renting. The income I received paid the rent...I just had to pay the utilities. I learned all about clipping coupons from the newspaper & how to plan the food shopping around the daily & weekly specials. Necessity was the mother of invention big-time. Somehow I needed an income...now. It was too late to try to go back to real estate....even a sale made right away would take 2-3 months to close with the commission received even later. What could I do? I didn't want to go on any type of assistance....my dad had always taught me that if a man is able, he must earn his own keep. If you don't work, you don't eat, simple as that. There are always exceptions to the rule i.e. sickness, mental incapacity, injuries, etc., but I didn't fall under any of those. I said to myself "I'm healthy, so I'll find something". I looked in the newspaper & took jobs delivering flyers, pizza, etc. (I always was appreciative of the tips I received!) I registered with Manpower, did roofing on a hotel being built, & delivered drywall & other building materials to building sites. I also worked on an assembly line checking labels & caps of various soap & cleaning products & packing them into boxes. Finally the 4 months passed, the sun came out, the wind died down & I was able to fly the balloon. That was so much fun. In fact, the weather was so good, I flew practically every morning & evening. I managed to save up quite a nest egg. This experience showed me 2 things.....first, here again was an evening business, & second, it was very seasonal. I had to find something else. To this day, I enjoy ballooning, but it's strictly a hobby, not a business. I decided it was time to head back to University....pick up that degree that I wasn't able to get when I was younger. I was accepted at the University of Alberta in Edmonton & started in the fall of 1986. That was great, but I only lasted 3 months....just couldn't get the course material into my head. Now what do I do? I was always interested in electrical type things so I headed to Victoria, BC, & registered at Camosun College in electrical technology. Here I got 98%...man what a difference...they even asked me to mentor other students & paid me for it! After I finished that course in the spring of 1987, I took a job wiring houses, but that just wasn't for me....I needed something more intellectually stimulating. But what? Running out of options, I had to go back to the thing I knew...real estate. I moved back home to London, Ontario in the fall of 1987, & started selling real estate again only to find out my license had lapsed. It was an accidental oversight, but when I went to renew, I landed myself in hot water because I had been selling real estate without a license. Not good. I immediately threw myself at the mercy of the Registrar......they did not fine me, but instead made me wait a few months before they gave my license back. In the meantime, what would I do? I had met my wife & was now married with a baby on the way. Again, necessity was the mother of invention. I had always been interested in telecommunications from a very young age & saw a job in the newspaper selling fax machines & office phone systems. I spent several weeks there receiving a weekly pay cheque, but I didn't sell a thing. I was more interested in the technical side. I read through all the telecommunication trade magazines I could find. I became interested in the proposed long-distance de-regulation hearings that were going to start with the CRTC (the Canadian Radio-TV & Telecommunications Commission). I could not, in good conscience, continue to take money from my employer & not sell anything...I just didn't feel right. I went into my boss & resigned. He begged me to stay...he said they were prepared to wait for things to break, with me, but I just couldn't do it. I didn't feel it was fair....I became very interested in the CRTC hearings that were going on & found myself absorbing every bit of information I could get my hands on.....this was totally the opposite of my University experience just a year or so, earlier. My heart just wasn't into selling......it was into learning everything I could find out about the de-regulation of the long-distance telephone business. Now what would I do? No pay cheque.....a baby on the way...bills to pay. My wife was working, but we needed an income from me as well. It was 1988 & back into real estate I went...again! Man oh man! To make a long story short, I was able to make quite a few sales, but most of my work was in the town of Strathroy....& that was long-distance.... 42 cents a minute! My long-distance bills were adding up quickly. There must be a better way! Suddenly I had one of those rare flashes of inspiration come over me......it was so strong. I went to the car & pulled out the map of Ontario. I went to the library & started looking through all the phone books. I spent the day there drawing circles around all the cities & towns in Ontario on the map.....connecting them with lines according to which town was local to the other. All this information was in the front of the phone books. To my absolute amazement, the entire province interconnected! I could not believe my eyes. What this meant, is that, if you could somehow jump the calls through each town, you could call virtually anywhere in the whole province for free. It just seemed to good to be true...why hadn't other people seen this? Was I the first? So I got my answer......I could make free calls to Strathroy if I jumped the call through the town of Mt Brydges, because it was local to both London & Strathroy. I rented 2 lines there & installed re-dialing equipment to transfer the calls. It worked.....what a discovery! Bell Canada of course told me what I was doing was illegal....they even sent a fellow to my house to ask me questions. I immediately went through the tariffs to find out where it was illegal. It turns out it was legal to set this up & I could share this service with others as long as I had everyone sign a "sharing agreement" where everyone was liable for the bill if I didn't pay. At the same time, I had read about how Ed Jarmain of London, ON setup the first cable system in Canada to share TV signals with his neighbours.....why couldn't I setup a sharing system for long-distance? I installed 10 in & 10 out lines & began signing people up. I paid the Bell bill 2 months in advance & sent copies to everyone in our group so there would be no concerns. This was the "London Telecommunications Sharing Group", which would be later shortened to London Telecom. Through 1989, I was still selling real estate & still continuing to absorb everything I could on the upcoming de-regulation of the long-distance business. In the meantime I set up 2 other groups with a total of over 200 members. A few months later, in 1990, it was announced that long-distance competition would now be allowed in Canada. It was great, because I knew all the rules....totally....I had been studying & reading up the entire time, following everything. The sharing group agreement was no more & my members were now customers in one of the first alternative long-distance companies in Canada, London Telecom. read - "The Story of How London Telecom Started"
view - "Awards & Plaques received by London Telecom"
view - "Magazine, Newspaper & Other Articles on London Telecom"
view - "Selected London Telecom Advertising Copy"
view - "London Telecom VIDEOS"
read - "London Telecom - Opportunity out of Adversity, Discontentment & Need"
read - "First taste of being an Entrepreneur"